Thailand guide, offering accurate information on Thailand hotels. How to organise your holiday to Thailand. Popular activities, photographs and information about Thailand hotels. Thailand is a wondrous kingdom, featuring Buddhist temples, exotic wildlife, and spectacular islands. Along with a fascinating history and a unique culture that includes delectable Thai food and massage, Thailand features a modern capital city, and friendly people who epitomize Thailand’s “land of smiles” reputation. Already know where you want to go in Thailand? Skip to our list of Areas in Thailand to book your Thailand hotel by clicking here. Thailand is one of the most visited countries in Asia, and with good reason. Known as the ‘Land of Smiles’, this ancient Southeast Asian nation’s fascinating culture has remained undamaged – successfully absorbing Western culture while maintaining its own heritage. With glorious weather and spectacular coastlines peppered with gorgeous beaches and blue lagoons, Thailand holidays offer something for everyone. From the energy and pace of Bangkok to the historic temples of Ayutthaya and beyond - no wonder most travellers who visit Thailand keep coming back for more. Most visitors to Thailand begin their trip in Bangkok, a modern Asian city that offers a mix of hip restaurants, pulsating nightlife and traditional charm. You’ll find the sprawling Grand Palace at the heart of the historic Rattanakosin Island. Next to the Palace is the impressive Wat Pho, or the ‘Temple of the Reclining Buddha’. The northern city of Chiang Mai, with its beautiful old city, is home to more than 300 Buddhist temples, some of which are among the most important in Thai culture. Here you can explore the mountainous countryside on the back of an elephant. If it’s white sandy beaches you’re after, the resort island of Koh Samui is lapped by the clear waters of the Gulf of Thailand. Tourist havens include Krabi, Koh Samui and Phi Phi Island, but if you want to escape the crowds, you may consider heading off the beaten track. The beachside town of Hua Hin offers some unique hotel options, while the northern province of Chiang Rai is a gateway to neighbouring Laos and Myanmar. Thailand accommodation ranges from cheap beachfront bungalows to some worldclass luxury hotels, with a range of options in between. Hostels are uncommon outside of Bangkok, although most Thailand hotels are relatively inexpensive. Tourist havens like Krabi, Koh Samui and Phi Phi Island offer an extensive range of accommodation. 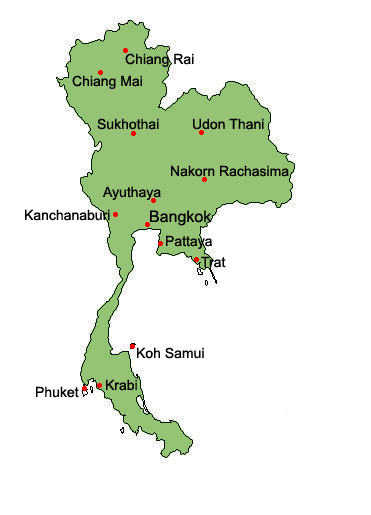 See our list of Hotels in each area of Thailand by clicking on the photos.